A Diamond in the Rough-The ability to see the potential of greatness and exceptional qualities in the unexpected. 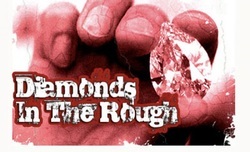 DIAMONDS IN THE ROUGH is Kappa Alpha Psi’s national campaign to promote the academic, social and service based Achievements of young men of color. It is an aggressive counter to the negative stereotypical images that have generalized and stigmatized young males for decades and provides a strong argument that throughout this country exists thousands of young men of color that are achieving in Every Field of Human Endeavor.